Update: The Nursery is finally finished! Hop over and check out the full reveal! Now – I know you guys know that I am having a baby and that I have been thinking about nursery ideas. What I bet you didn’t know is that one of the cribs I am trying to decide between is the Bonavita Peyton Lifestyle Crib. And since that was one of the Mood Board Monday options – I knew I had to design what I was thinking of for our Lil Man’s room. So here is the Peyton crib. 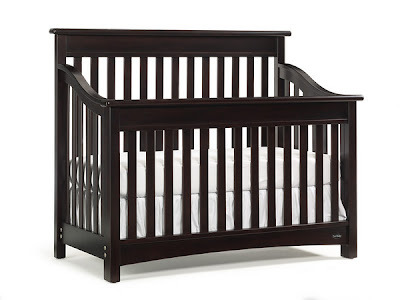 Not only is this crib beautiful and classic – it also tied for first place in the crib ratings by Consumer Reports. Yep – beautiful AND highly recommended. It ranked excellent in safety and construction and very good ease of use. And now it has been on my list of “cribs to consider”. So what did I come up with? Well – if you remember my nursery inspiration post I did a couple weeks back – I knew I wanted a couple things in my nursery. One, I wanted bright colors. Not primary colors – but bright jewel tones. Two, a book wall like my dream room by Elizabeth Sullivan. And once I found out we were having a boy – I knew I wanted a bright vibrant blue to be the main highlighted color of the room. Put that all together and this is what you get! 1. 5 pack of Blue Martha Stewart Pom Poms – I personally love the idea of pom poms over a traditional mobile. I would like to find some yellow and orange ones too. 2. Sahara by Porter Paint – this is actually a discontinued color but it is the color our whole place is painted. Since this is a rental – I am planning on leaving that as is. But I think it will make the perfect neutral base for the room to ground all my bright colors. 3. Peyton Crib – I think it really looks great in my design. Hmmm… decisions decisions! 4. Wild N Wooly Fabric Collection from Joann’s and Aqua Crib Sheet from Carousel Designs – I could not find any bedding sets in my “inspiration” colors. None. And I searched for hours! So instead, I have decided to make my own bumper and crib skirt. And when I finally found this adorable fabric on Joann’s site I was so excited! I am going to use the animal print for the bumper and the striped print for the skirt. The Aqua crib sheet is just the perfect touch to pull it all together! I love it! 5. Forest Babies Cuddle Fabric – I want to make a cute pillow to go in my rocker and this print pulls together all of my inspiration colors and should be super cozy. 6. Newco Taylor Classic Swivel Glider and Ottoman – this is actually my “splurge” for the nursery and the only thing we have actually bought. I got a coupon this weekend to get the ottoman free so I snatched it up. It is so comfy – I can’ t wait to spend a lot of time in it with the Lil Man. 7. Hand Loomed Rug from Overstock.com – I think a little bright blue on the floor will is just the right touch for the room. And it pulls together a lot of the other colors in the room. 8. Peyton Dresser – Matches the crib so it is the perfect addition. I would use the top as a changing table. 9. The Wall of Books – these I made out of some Ikea Lack floating shelves and some classic kids titles from Amazon.com. If I get my way – there will be more than just two of these! 10. Linen Honeycomb Blackout Shades and Home Essentials Solid Fabric in Grafton/Slate – To me – blackout shades are a must. I know I was fussy about that as a baby (and I still am) so I don’t want to take any chances. These Honeycomb Shades are the perfect addition. Top it off with some bright blue fabric for either a valance or cornice and I am set. Here it is one more time. Squeal! I just love what I have come up with! So there you go! That is my current nursery design! I am so excited about it! I hope you get a chance to come up with a Mood Board of your own! If nothing else – hop over and check out everyone else’s submissions! I can’t wait to see what everyone else comes up with! It's beautiful Jess. The pieces all look like they could last throughout a child's entire life at home. Love your room and your little one is sure to love it as well. I love that book idea wall and the colors are great! Such a cheerful spot. I played along too as I have a 4 month old who is living in an undecorated room due to a cross country move when he was 7 weeks. So, this was good to get me refocused on moving his room along! So fun, what a beautiful room. love that-it's perfect for what you are describing with the primary colors. great mood board! LOVE the book wall idea. :) Such a cute and functional way to decorate! Good looking room Jess!Yes,on the blue pom poms, they make the room! Very fun room!!! I like it!! That nursery looks great! I love the colors. So exciting! Can't wait to see it all come together. So exciting, Jess! It looks great!! I can't wait to see it come to life. I can't wait to see the finished product. It's going to be adorable! And I love the book wall idea! Love your choices, Jess! They'll last a long time - until YOU get bored with them, heehee ;) And boys are sooo different than girls. I didn't have girls, only boys, but I paint mostly for girls. Can you say PURPLE?!? Question: how do you make your mood board? I'd love to do this for the feng shui blog. Thanks! Love, love, love!!!! Can you decorate my future nursery!?!? P.S. I love your ideas for the little man's nursery! So happy to hear you are expecting, Jess. :) I've been out of the loop in the crafty blog world, so this is great news to hear!! It's going to be a beautiful nursery!